For the last two days I have not been hungry at all, unless I go more than 3 hours without eating. And no crazy binge urges. I am happy with that. Here's what I ate on Thursday. 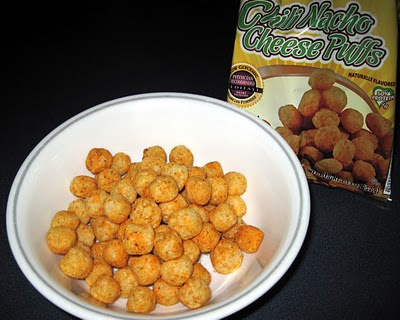 3:30PM: Medifast Chili Nacho Cheese puffs. I hadn't tried these before so I wasn't sure what to expect. They come in a little bag and when I poured them into a bowl, they smelled like chili or tacos. They are small... the size of a marble... and the texture is very similar to those cheese balls we all know about (these are a tiny bit crunchier). These have a really nice flavor; not overwhelming but just a bit spicy, cheesey, and chili-like. I liked them and think they'd be great to fulfil a desire for something snacky. They actually took me awhile to eat and it felt like a pretty decent sized serving. Thumbs up for the Chili puffs! (110 calories, 11g protein, 4g fiber). 6PM: Dinner was a can of water-packed tuna mixed w/1T light mayo, a bit of mustard, & part of a pickle spear (chopped). I ate the tuna on a bunch of Romaine leaves, with a side of angel hair shredded cabbage fried in 1/4 tsp of toasted sesame oil and seasoned with salt and pepper. 8:30PM: Smores Crunch Bar. This is another one I hadn't tried. First thing I noticed: it smells *exactly* like graham crackers! It is the same size, texture, shape as the other Crunch bars I've reviewed but it had cute little marshmallows on the top. It tasted good but *very* sweet. Almost too sweet. It was good but I like the other crunch bars better because they are not as sweet. The Medifast foods really are decent overall. My very favorites are the Hot Cocoa (with coffee added, and/or over ice) and the Honey Mustard pretzels. I would eat these every day if I wouldn't run out. I am eating my last pack of pretzels right now and I know I am really going to miss them until I get more! This morning I had a cinnamon mocha, an Egg Beater omelet full of mushrooms, chives, and a bit of cheese along with a cup of green tea. I have some fresh homemade turkey soup simmering on the stove for dinner, and I am feeling really good! Hope you all have a wonderful weekend! That's great that you are not hungry. That is about right to eat every 3 hours...it's what I do anyways. i'm glad this is working for you! I'm glad this plan is going so well for you. I try to eat every 3-4 hours myself..I find it helps control the hunger so I never get out of control crazy hungry. I'm glad that you are liking most of the food. I was worried that you wouldn't like it, I know you don't each much processed foods. Keep up the great work. Looking good. You are doing so great Lyn! :) This makes my heart happy! The parmesan puffs are even better. I agree, they take a long time to eat. There's a lot of them in the bag. I ate a bag in the movies and it was perfect. Can't wait to see your next time! 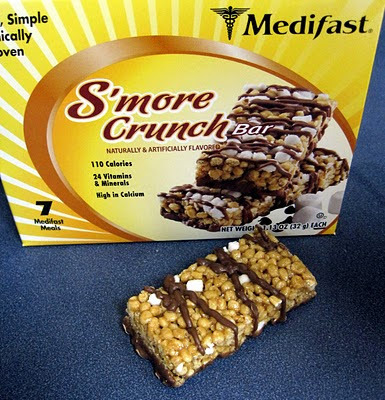 :) I find Medifast simple and a real "no-brianer" that helps you control the cravings. I was thinking about that and folks who are institutionalized probably lose an interest in food too just because when you don't have any creative leeway and have to eat from a list of packaged stuff, you probably lose that excitement about food and it becomes a way to keep from being hungry. The Biggest Loser folks say it a lot, but it's true. "We lived to eat, but these people eat to live." I'm excited about your next weigh-in. I think it'll be pretty satisfying. I'm so pleased for you. There is always risk when going onto a different plan even when well researched. I'm sure you did so with some trepidation and here you are being vindicated in your choice. Your posts are making me consider trying Medifast. I had no idea you had so many options with what you ate! About how many calories a day are you getting? About 1000 calories, 105g protein, 85g carbs, 25-30g fiber. I am so glad that the program is giving you a break from the cravings! I love when i don't have them for a while. Do you know how long you will be doing it, or are you doing it until you get to goal weight?? I really like reading your blog, Lyn. It gives me so much insight. I haven't tried the puffs but I think I will try them in my next order. Keep up the good work!!! I'm not really sure! I committed to doing a month, and the plan is to decide on a month by month basis. I am pretty confident that I am going to do another month... no reason not to! I will do it until it "doesn't work for me" anymore, for whatever reason, OR until I get to goal if I do well on it over time. sounds good! i realize i'm not hungry ever either, which is a good thing! i used to feel like i was doing something wrong if i ate at a certain time but didn't hear my stomach rumbling. I'm so happy that Medifast is working out for you...and I'm just as curious as many as how the transition program works. I don't know if I've commented before or not, but I've been lurking for some time. I am Bethany of "The Great Reduction"'s sister. I can't wait for your latest weigh in. I am excited about how well you are doing on this program, and I think it is just what you needed to get back on track and give you a boost. I have read all of your posts since the beginning, and I am rooting for your continued success. I think I'd have lost my self control by now. I am not sure I could have a coffee with nothing to eat and then wait until 8.30 - an hour and a half and eat only a hard boiled egg. You are obviously very disciplined Lyn...and that is where I (and I am sure thousands..(millions?) of others) slip up. When I am up I need tea first thing and I need food. Surely your blood sugars are a little low after waking? Do you find it a struggle to get by for the first three hours of your day on only a boiled egg? That's curiosity by the way Lyn, and not criticism. I imagine this must be a very low calorie diet? You are doing extremely well sticking to it...and as you say, you aren't feeling hungry. I am sure our mindset is responsible for whether we succeed or fail. I determine to 'be strong' and often fall at the first hurdle..or the slightest scent of food being cooked..
You anticipated this eating plan would be easier for you...and you are sticking to it. How hard has it been? Are you so focussed that you aren't thinking about food treats of any sort? Again curiousity..because I just can't see myself holding out until lunchtime if all I had to look forward to was a packet of dried soup - or something similar. I am in awe Lyn...and I think you will see a fantastic loss in the month of March. Your determination is inspiring. Remember, each Medifast food is like a mini meal. The Chai Latte is not just tea and milk; it contains 14g of protein and 4g of fiber and is designed to keep me full for 2-3 hours. Same for all of the Medifast meals. They just come in different forms... Latte, Hot Cocoa, chili, puffs, etc. I'm not usually hungry at all on this plan although I had 2 hungry days last week probably associated with my cycle. I have not 'cheated' on this plan because I really have no cravings or binge urges. I am eating very low sugar and moderately low carb (85g a day or so... up to 100) but high protein 100+ g/day) which seems to keep the sugar cravings away for me. But I do think commitment and determination play a big part, because I still have food thoughts but I choose not to act on them. I feel a lot more in control. I think we (well, me at least!) get strange mental blocks when we embark on 'diets'. I ought to try a drink and see if it satisfies me. I don't do this because for me a drink is synonymous with food...the drink is there because it washes down the food!